The Mandom Group's mission is co-existence, mutual growth and mutual creation with global society. Consequently, to realize our core philosophy, we are dedicated to generating stable profits by pursuing efficiency, while ensuring soundness and transparency. As a result, we look to achieve sustainable, steady growth together with consumers, society and other stakeholders. The activities of the Group are overseen by the Audit & Supervisory Board. With legal oversight from its members as the basis for corporate governance, we invite multiple external directors to sit on our board, to reinforce our monitoring and advisory functions. By clarifying responsibilities and delegating authority under a system of supervisory and executional officers in charge of specific operations, we have created a system for the proactive and expeditious execution of operations. This system ensures soundness and transparency, and appropriately pursues efficiency. The Group has also voluntarily established the Compensation Committee, more than half of whose members are external directors, as well as the Nominating Committee. Executive compensation and appointments are reviewed by these entities, and determined by the Board of Directors' resolution with close reference to the results of such reviews. 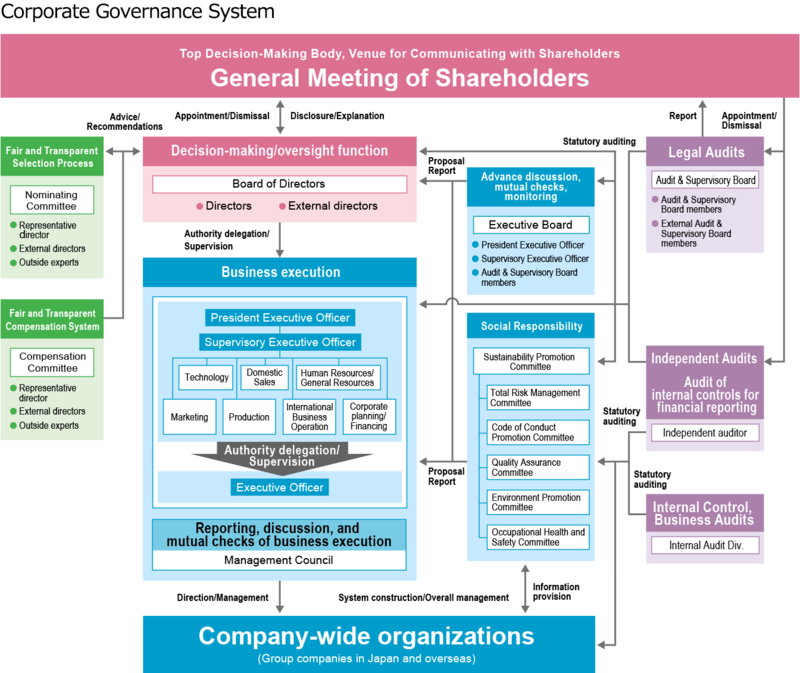 The Group's corporate governance structure is shown on the next page (Corporate Governance System). To ensure management soundness and efficiency, the Group employs an extensive range of management monitoring functions. Moreover, based on our understanding of the importance of reflecting front-line management views in decision making, the Board of Directors includes not only senior management, but also certain executive officers with special titles who are responsible for overseeing certain supervisory execution domains, and independent external non-executive directors. In addition to establishing an Audit & Supervisory Board, we have voluntarily established advisory panels for the Board of Directors, and apply mutual checks and oversight between executive officers on the board as well as oversight and supervision from external directors. This structure is rigorously monitored by the Audit & Supervisory Board, and we believe this approach will contribute to strengthening corporate governance. Under the governance structure outlined above, the Board of Directors has established basic policies to ensure appropriate operations, including the establishment and revision of internal regulations, their promulgation and thorough implementation, and the establishment of special advisory panels. Executives and employees strive to implement these regulations, with the Internal Audit Division and the Audit & Supervisory Board exercising rigorous oversight and supervision. In particular, the Group's Code of Conduct Promotion Committee helps to ensure management compliance by promulgating awareness of, and adherence to, our compliance standards. Our Helpline System for whistleblowers also helps to avoid and minimize risk. In addition, our Internal Audit Division ensures the trustworthiness and accuracy of our financial reporting. The division is responsible for establishing and monitoring the management of internal control systems relating to financial reporting and for carrying out internal audits. The division also submits reports as appropriate to the Board of Directors and the Audit & Supervisory Board, which review the reports on an ongoing basis and work to devise structures to implement recommendations for improvement. The Total Risk Management Committee is the principal vehicle for the Group's total risk management system, based on the enactment of the Total Risk Management Promotion Regulations. This committee prioritizes the management of risks that may materially impact business continuity. Accordingly, the committee promotes the preparation of manuals and focuses on identifying, analyzing and evaluating signs of the materialization of risks to detect such risks quickly and introduce preventive measures. We have formulated Affiliated Company Management Regulations, which apply to affiliated companies in Japan and overseas. We have positioned the Corporate Administration Division, the International Business Division.1 and the International Business Division.2 to supervise Japan and overseas subsidiaries. Through the measures described below, we seek to ensure the appropriate operations of the corporate group. As necessary, the Company's executives and employees serve as directors or Audit & Supervisory Board members at subsidiaries, where they monitor and advise on the compliance, efficiency and appropriateness of subsidiaries' operations, thereby ensuring the appropriate operation of the corporate group. The Company has expanded the scope of application of its Total Risk Management Promotion Regulations to include subsidiaries. Based on these regulations, the Total Risk Management Committee provides guidance and supervision on the establishment of risk management structures at subsidiaries. This committee prioritizes providing management guidance on risks that have the potential to significantly impact the business continuity of subsidiaries. To help avoid or minimize these risks, the committee provides guidance and supervision on the creation of manuals to respond to risks at subsidiaries. The Company has expanded the scope of application of its Code of Conduct Promotion Regulations to include subsidiaries. Based on these guidelines, the Code of Conduct Promotion Committee provides guidance and supervision on creating compliance structures at subsidiaries, as described below. (1) The Company produces and distributes the Mandom Group Code of Conduct (translated versions) for application to subsidiaries and provides guidance and supervision to ensure awareness and thorough adoption of the code. (2) The Company produces and distributes training materials related to code of conduct education that applies to subsidiaries and provides guidance and supervision on subsidiaries' conducting of code of conduct education. When the Company's Internal Audit Division conducts internal control audits of subsidiaries, the division sequentially monitors the state of awareness and entrenchment of the Mandom Group Code of Conduct and the operational status of the risk management structure. The Company has concluded agreements with external directors Satoshi Nakajima and Satoshi Nagao, based on Article 427-1 of the Companies Act and Article 24-2 of the Company's Articles of Incorporation, to limit their liability for damages as defined in Article 423-1 of the Companies Act. The limit of liability for damages pursuant to these agreements is ¥10 million or the minimum amount as specified in Article 425-1 of the Companies Act, whichever is higher. The Company has concluded agreements with external Audit & Supervisory Board members, Yukihiro Tsujimura and Masahiro Nishio, based on Article 427-1 of the Companies Act and Article 32-2 of the Company's Articles of Incorporation, to limit the liability for damages as defined in Article 423-1 of the Companies Act. The limit of liability for damages pursuant to these agreements is ¥10 million or the minimum amount as specified in Article 425-1 of the Companies Act, whichever is higher. The Company has in place an Internal Audit Division to ensure the appropriateness of business processes, the efficiency of organizational management and the effectiveness of internal controls, including for affiliated companies in Japan and overseas, as well as to audit the appropriateness of accounting. The Internal Audit Division's audit activities include auditing the execution of operations of the Company's various departments and affiliated companies in Japan and overseas and auditing the state of compliance with laws and internal regulations. The division submits reports of each of its audits to the president executive officer and directors in charge, and reports the content of these audits to the Board of Directors and the Audit & Supervisory Board. With regard to accounting audits, the division verifies the monthly, quarterly and year-end financial statements submitted by the Finance Division. In addition, the person responsible for the Internal Audit Division serves as a standing member of the Audit & Supervisory Board Member Liaison Council (described below), exchanging information with the Audit & Supervisory Board members, liaising with other departments, and verifying the establishment and operational status of internal control systems. The Company's Audit & Supervisory Board comprises four members, two of whom are standing Audit & Supervisory Board members from within the Company and two of whom are external Audit & Supervisory Board members. In principle, the Audit & Supervisory Board meets monthly; during the fiscal year under review, the board met 13 times. Audit & Supervisory Board members perform their audit activities in accordance with the audit policies defined in the Audit & Supervisory Board Regulations and the Standards for Audits by Audit & Supervisory Board members, attend important meetings (Board of Directors, Management Council, Executive Board), express opinions as necessary, visit principal business locations in Japan and affiliated companies overseas, and offer advice to the representative director. With regard to accounting audits, members conduct the required audits of monthly financial materials submitted by the Financial Division, and receive audit planning reports (annual) and regular accounting audit reports from the accounting auditor. The Company has formulated Regulations for Ensuring the Effectiveness of Audits by Audit & Supervisory Board members. These regulations clearly state the reporting obligations and methods for reporting by directors and employees to Audit & Supervisory Board members, as well as their obligation to cooperate with audits by the Audit & Supervisory Board members. The regulations therefore establish a framework for effective audits by Audit & Supervisory Board members. In addition, the Audit & Supervisory Board Member Liaison Council (attended by members of the Audit & Supervisory Board, Internal Audit Division, General Administration Division, Legal Affairs Division, Corporate Management Division and Financial Division) convenes monthly. As necessary, members also exchange information and conduct hearings with the accounting auditor, directors of affiliated companies, Internal Audit Division and heads of other departments to boost audit efficiency and effectiveness. The Company has commissioned Deloitte Touche Tohmatsu LLC to conduct accounting audits based on the Companies Act and the Financial Instruments and Exchange Act. No special-interest relationship exists between the Company, this accounting auditor and its employees assigned to conduct audits of the Company. The Company and Deloitte Touche Tohmatsu have a contract in place concerning audits according to the Companies Act and the Financial Instruments and Exchange Act, and the Company provides audit compensation in accordance with this agreement. Furthermore, Deloitte Touche Tohmatsu has measures in place to ensure that the people it assigns to perform the Company's accounting audits do so for no more than a specified period of time. The names of the certified public accountants assigned to conduct activities for the Company during the fiscal year under review, as well as the structure of personnel assisting in audit activities, are described below. The Company has two external directors and two external Audit & Supervisory Board members. Other than ownership of the Company's shares, no special-interest relationships exist between any of these external executives and the Company. Satoshi Nakajima, External Director, concurrently holds posts as an Audit & Supervisory Board member of Osaka Gas Liquid Co., Ltd. and as an External Director of Yume no Machi Souzou Iinkai Co., Ltd., No equity relationships, important business relationships or other special relationships exist between the Company and these companies. There are no equity or business relationships between Satoshi Nagao, External Director, and the Company, nor any other special relationships. Yukihiro Tsujimura, External Audit & Supervisory Board member, is an attorney who concurrently serves as Representative of the Yukihiro Tsujimura Law Office. No equity relationships, important business relationships or other special relationships exist between the Company and this law office. Masahiro Nishio, External Audit & Supervisory Board member, is a certified public accountant who concurrently serves as Outside Corporate Auditor of Shimadzu Corporation and SUMCO Corporation and Director of Nishio CPA Firm. No equity relationships, important business relationships or other special relationships exist between the Company and Shimadzu Corporation, SUMCO Corporation or Nishio CPA Firm. By appointing external directors and external Audit & Supervisory Board members who have no special-interest relationships with the Company and are highly independent of the Company, the Company aims to reinforce its corporate governance and augment the Group's overall management quality. The Company has formulated the Standards for the Independence of Independent Outside Executives shown below. The above-mentioned external directors and external Audit & Supervisory Board members satisfy these standards and the Tokyo Stock Exchange's independence criteria. The Company has notified the Tokyo Stock Exchange that all of these executives are independent executives. The Company has formulated the following standards related to independence with respect to its selection of candidates as independent outside executives (external directors and external Audit & Supervisory Board members designated by the Company as independent outside executives). Candidates must satisfy the various conditions for external directors and external Audit & Supervisory Board members based on the Companies Act. Individuals to whom additionally none of the following apply are considered to satisfy the Company's independence standards. A customer to which the Mandom Group provides products or services and for which the products or services provided by the Mandom Group account for more than 2% of consolidated net sales of the Mandom Group in the most recent business year or the current business year. The external directors provide recommendations and advice on such broad-ranging items as management strategy and corporate governance based on an abundance of experience in practical operations and management. The external Audit & Supervisory Board members, meanwhile, provide appropriate comment from an independent perspective about audit methods and the execution of operations by Audit & Supervisory Board members. Where necessary, the external directors and external Audit & Supervisory Board members request reports from related institutions and related departments on the content of internal audits, audits by Audit & Supervisory Board members and accounting audits, and exchange information appropriately. Furthermore, the Audit & Supervisory Board Member Liaison Council provides a venue for forging close ties among internal control departments and conducting hearings as necessary and appropriate. In addition to ensuring soundness and transparency, the Company's compensation for operational executive directors is aimed at the appropriate pursuit of efficiency, leading to the achievement of management plans and the enhancement of corporate value. To this end, the Company sets an amount of fixed compensation to ensure steady devotion to their duties. In addition, a certain amount of performance-linked variable compensation is provided to serve as an incentive to a higher level of motivation. The Company's policy is to strike a balance between these two. The Company sets fixed compensation amounts at appropriate levels by referring to third-party data. These amounts differ according to executive rank and Group management responsibilities. Performance-linked compensation reflects business performance with reference to the preceding fiscal year and achievement of planned targets, and payment amounts are set for each fiscal year. In addition, amounts paid to individual operational executive directors are based on an evaluation of their individual performance. Compensation for non-executive directors (excluding external directors) is composed solely of fixed compensation. Compensation for Audit & Supervisory Board members is set at an appropriate level that reflects their important role and responsibility for conducting the rigorous legal audits that form the basis of compliance management for the Group and improve corporate value. As the role and responsibility of Audit & Supervisory Board members is to conduct rigorous legal audits unrelated to the Company's operating performance, their compensation is composed only of fixed compensation, which is not affected by operating performance. The Compensation Committee, a majority of whose members are external executives, deliberates and recommends director compensation amounts. Based on these results, the Board of Directors resolves compensation amounts within the scope approved by the General Meeting of Shareholders. The Compensation Committee also deliberates and makes recommendations on policies related to determining director compensation amounts. The Board of Directors then resolves the amounts based on these results. In addition, at the 101st Annual General Shareholders' Meeting held on June 22, 2018, introduction of a restricted stock compensation plan was approved in order to further promote shared value with shareholders and to grant medium -to long-term incentives for the Company's Directors (excluding Outside Directors). Audit & Supervisory Board member compensation amounts are determined according to the capabilities and audit experience of individual members on a rational basis and referring to third-party data. These amounts are determined through deliberation among the members of the Audit & Supervisory Board, including the two external members. Policies for determining Audit & Supervisory Board member compensation amounts are also decided through deliberation among the Audit & Supervisory Board members, including the two external members. The Company's Articles of Incorporation provide that the number of directors shall be 12 or fewer. To resolve a director's appointment, a meeting must be held that is attended by one-third or more of shareholders with exercisable voting rights. The Articles of Incorporation provide that appointments must be approved by a majority of these voting rights and not through cumulative voting. The Company's Articles of Incorporation provide that "in accordance with Article 165-2 of the Companies Act, treasury stock may be acquired in the market by resolution of the Board of Directors." This measure is intended as a component of expeditious capital policy. With regard to the exemption of liability for directors, the Company's Articles of Incorporation provide that "in accordance with Article 426-1 of the Companies Act, by resolution of the Board of Directors the Company may set limitations on liability for damages for directors (including former directors)." This measure is in place to ensure superior director personnel and provide an environment for proactive decision making and execution of operations, without causing directors to refrain from such duties. Furthermore, with regard to the exemption of liability for Audit & Supervisory Board members, the Company's Articles of Incorporation provide that "in accordance with Article 426-1 of the Companies Act, by resolution of the Board of Directors the Company may set limitations on liability for damages for Audit & Supervisory Board members (including former Audit & Supervisory Board members)." This measure is in place to ensure superior personnel as Audit & Supervisory Board members and provide an environment that enables Audit & Supervisory Board members to adequately fulfill the duties expected of them. The Company's Articles of Incorporation provide that "in accordance with Article 459-1 of the Companies Act, dividends of surplus may be determined by resolution of the Board of Directors except as otherwise provided by laws and ordinances." This measure is intended as a component of expeditious capital measures and dividend policy and does not eliminate the General Meeting of Shareholders' rights related to resolving dividends from the surplus. The Company's Articles of Incorporation provide that items requiring extraordinary resolution by the General Meeting of Shareholders are "to be determined in accordance with Article 309-2 of the Companies Act, at a meeting attended by one-third or more of shareholders with exercisable voting rights, and approved by two-thirds or more of shareholder voting rights attending." The aim in mitigating the number of people required for extraordinary resolutions by the General Meeting of Shareholders is to ensure expeditious decision making and execution of operations. Rather than relying on external standards and adopting a passive compliance stance that "as long as we are legally compliant, all is fine," the Mandom Group sets voluntary standards that exceed legal requirements, taking an independent and proactive stance toward protecting consumer safety and benefits. We established the Mandom Group Code of Conduct (revised 5 times since establishment in 1999) as a common compliance program that should always keep in mind to embody our corporate philosophy. The Code of Conduct Promotion Committee was established to be in charge of promoting the Code of Conduct throughout the Mandom Group. This committee leads compliance education and awareness activities. In December 2002, we introduced the Helpline System (which was expanded to cover business partners in 2007) to give employees, or "whistleblowers," a chance to inform us when they notice any laws being broken at work. This allows us to quickly discover non-compliance and subsequently prevent problems before they occur. Under this system, the anonymity of whistleblowers is protected and retaliatory measures against them are strictly forbidden. In December 2002, Mandom Corporation introduced the whistleblower system "Helpline System" for early detection, prevention of occurrence and prevention of recurrence of risks relating to violations of laws and social norms. This is a system receiving reports and consultation from employees when they observe in their workplace any acts that break or are at risk of breaking laws or our Code of Conduct. The Code of Conduct Promotion Committee, which includes external members (corporate legal advisors), serves as the point of contact. The whistleblowers are protected against retaliatory measures or disadvantageous consequences due to their action. In September 2007, the System was expanded to cover business partners of Mandom Group companies in Japan. Business partners who become aware of directors or employees of Group companies in Japan engaging in acts that are not compliant or are at risk of non-compliance of Mandom Corporation and Group companies or its directors and employees are requested to report these to the Helpline, using the procedure described below. When the report of such a case is received, the Code of Conduct Promotion Committee will take the lead in investigating the case, identifying the causes, preventing non-compliant acts, prohibiting them, preventing their recurrence and finding resolutions to problems. Business partners who can access the Helpline System are suppliers, customers and other business associates of Mandom Corporation and Group companies operating in Japan. We request business partners reporting cases by revealing the real name, not by using anonymity to perform the fair investigation. The case and their details that are reported (including personal information such as the name of the whistleblower) will only be placed in the possession of our investigators (Code of Conduct Promotion Committee) and will not be used for purposes other than the investigation and subsequent actions arising from the respective reports on non-compliance. The Group will not put the whistleblower to any disadvantage due to the reporting of the case and will not request business partners to which the whistleblower belongs to disadvantage the whistleblower in any way. However, this guarantee will not apply to any unfair reporting that is libellous, slanderous or in any other way contrary to the purpose of the Helpline System (avoidance and minimization of risks about violations of laws and social norms). We will receive report by phone, fax, email or letter. Please refer to the specimen case report form attached. Insofar as possible, please report your case using this format. When we receive the report, the Helpline will contact you for confirmation of the fact. Please ensure that you clearly state your contact details and methods.